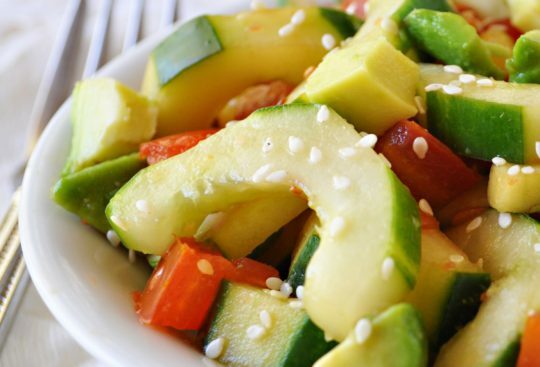 The citrus and ginger-soy sauce dressing turn cucumbers, tomatoes and avocados into a splendid salad. Serve this on a warm summer’s day to add the perfect flavor to your next gathering. Partially peel (peel in strips lengthwise) cucumbers, cut in half lengthwise. Remove seeds by scraping with spoon and cut into thin slices horizontally (instead of chopping), about 2 cups sliced. In bowl, place cucumbers, avocado and tomatoes. In smaller bowl, whisk together soy sauce, vinegar, orange and lemon juice and ginger. Toss with cucumber mixture. Sprinkle with sesame seeds, serve. This recipe makes 4 (3/4 cup) servings.